[p.118]SO many people, when they don their memory caps, associate the removal of gates from their proper hinges, the transportation of signposts to ridiculous settings, and the placing in peculiar positions of wagons and carts and plows (astride the barn roof, etc.) as the regular variety of Halloween sport. It used to be so, and while some of it was funny, if nothing was destroyed, it was too often of a hoodlum character and proved a real annoyance. A little of this has held over to the present day, but in general, the trend is toward more genteel manners and kindly frolics. This has given rise to an increase in real pleasure to a great number of people; and why not? The congregating of agreeable young people on this occasion is a great friendship asset. Young people’s organizations make merry to good advantage, and some of the older ones are not adverse to joining in at times. 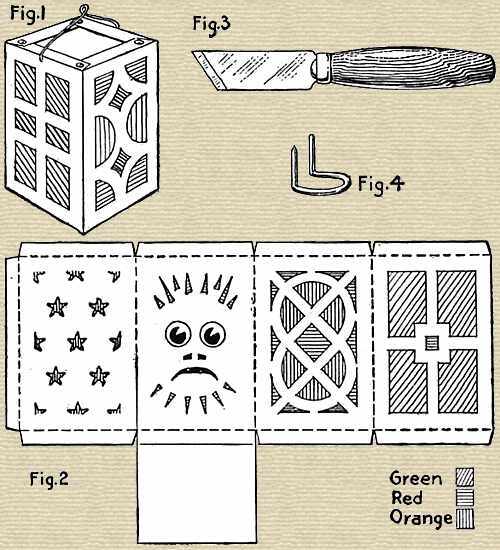 A square-shaped lantern and the pattern for cutting the sides from cardboard in one piece, the knife for cutting the cardboard, and the candle-holder. Appropriate illumination may be worked out with home-made and Chinese lanterns hung on porches from trees and on lines from the house to trees, or from tree to tree. The old pumpkin head is still a factor of the Halloween celebration. Cat head, owl, and Japanese hideous faces all add to the creepy feeling of the evening. Good lanterns with beautiful geometric and architectural designs, also hideous faces, can be made of cardboard packing boxes, or hollow forms can be folded up into required shapes. The square shapes, as in Fig. 1, are the most practical and most easily decorated. In Fig. 2 is shown a plan for the construction of the form of Fig. 1. The flaps at the upper part serve to stiffen the top and the ends of the flaps overlap each other. The lower flaps secure the bottom in place. The lantern may be pasted, glued or fastened together with paper fasteners, [p.119] according to the thickness of the paper or cardboard used. The openings should be cut before the lantern is fastened together, a paring knife or regular cardboard knife is good for cutting, as the point will go well into the corners. In Fig. 3 is shown the cardboard knife. It will be best to paste the colored semi-transparent paper on before folding it. If tissue paper is used the paste should be put on the frame and the tissue then pressed down on the surface. Care should be taken in handling the tissue as it tears easily when wet. If opaque portions are to be pasted to the tissue for a design they should receive the paste. Green, red and orange are about the best colors for lanterns. In one of the illustrations a hat box is shown which was made into a lantern, the design being taken from a cathedral window. A candle holder can be made of wire bent in the shape shown in Fig. 4. Put prongs through from the underside and paste or glue a small piece of cardboard over the loop portion. If the lantern is placed on a table the candle can be pressed down on the points. A little sand in the bottom will go far to prevent destruction by fire. A light wire bail is attached to the top portion. A number of lanterns should be planned and made some time before the celebration night so as to have an ample supply. Various designs for making window posters. Also a lantern of a round form that can be made of a hat box, the design for this being taken from a cathedral window. A kind of illumination that is quite similar to the lantern decoration is the mounting of opaque pictures on semitransparent backgrounds, which in turn are mounted on heavy paper with some kind of rectangular, circular or elliptical penetrations, the whole thing being fastened to the window sash. From the outside the design shows up by the lights within the house. Another illustration shows a good-sized window design of a witch. The body is made of black paper and the tissue of green. The gray building paper was used for the outside portion. The vertical stripe should be avoided by using a larger transparency sheet or by less lapping. The doubling up of tissue paper shows more on the plate than when illuminated, but overlapping should be reduced to a minimum. The reason that the doubling is not so pronounced when in service is that the color helps out the design and a little increase of a light color is not so conspicuous. If the window is not too large the tissue paper may cover the whole sash and the opaque objects placed accordingly. Other designs are shown in Fig. 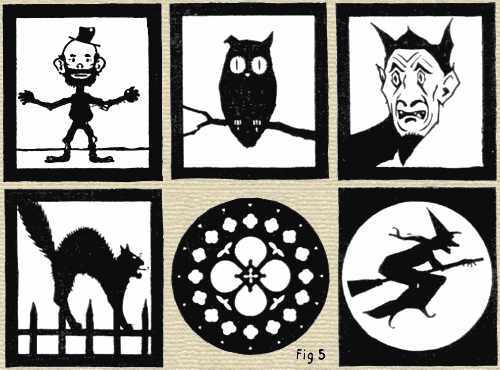 5, some of which may also be used on a smaller scale for lanterns. A witches’ caldron is a good setting piece for outdoors. Three sticks are lashed together for the tripod. Three laths will do if round sticks are not convenient. A kettle should be hung [p.120] from the tripod. If there is a bare space on the ground for this performance a little real fire may be kindled under the kettle and some marshmallows toasted, thus adding to the enjoyment. If it is best for the assembly to meet indoors, a fake fire can be produced with a few sticks of wood and some red crepe tissue paper with a hidden electric bulb underneath. Use sufficient paper so that it will not have the same brilliancy throughout. Some parts should only have one thickness while other places should have several. When the witch has muttered and stamped and blown at the fire someone may turn on the light. The witch should be dressed in loose black gown with a tall peaked hat. She stirs the kettle and mutters and the others around the circle moan in chorus. 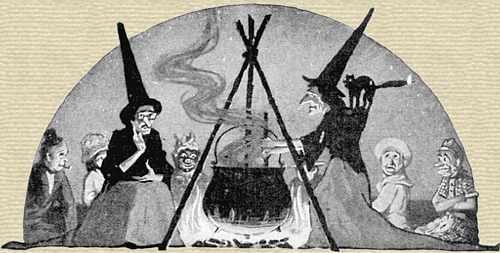 In the bottom of the kettle are a few live coals, and if this can be used outdoors, every now and then the witch sifts in a little red or green light powder*, and there is increased moaning. The powder must not be used in sufficient quantities to give a great amount of light, but just enough to give quite a little color. If used inside there must be good ventilation, otherwise the light powders must be omitted. The lights of the house should be subdued by covering with red or green crepe paper. Red or other colored light bulbs may be found useful. Formula for red light powder: potassium chlorate 40%, strontium nitrate 39%, sulphur 18%, charcoal powder 3%. Formula for green light powder: potassium chlorate 36%, barium nitrate 40%, sulphur 24%. In each case, the nitrate salts will give the characteristic colour from their metal ion familiar to any student that has seen in a chemistry demonstration. In a flame test, strontium imparts a scarlet colour and barium gives bright green. The same results are given when used in fireworks. Potassium chlorate is an oxidizer which will aid combustion, also used in fireworks. Sulphur may also add a pungent odor evoking a sense of the devil's work, as released from hot springs and volcanic vents, from the deep underground where the devil is said to dwell.